Stan Hywet Hall and Gardens have been one of those awesome mysterious places to me since I was a little girl. We used to go there on school field trips. The girls especially loved going into the gift shop and determining how many trinkets we could get with our couple of dollars. 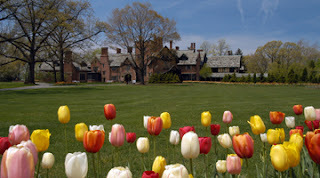 The Sieberlings built Stan Hywet (Old English for "Stone quarry) in the early 1900s.The Sieberlings founded the Goodyear Tire & Rubber company and built this lovely country estate with their rubber money. It's not as big as the Biltmore Estate, but its every bit as grand. Last I knew there was still one lady, a descendant of the Seiberlings, living in the gate house. Want to know what's even more interesting about the gate house at Stan Hywet Hall? It was the place where Alcoholics Anonymous got it's start. If you're ever in Northeast Ohio, check out the Hall and Gardens. Take your camera, it makes for a lovely backdrop.